You will be given a reference e-book to read which has 216 pages And the test will be based on that e-book , you can take final test within 1 year of purchase. Embedded system refers to a computer system primarily designed for certain control functions that form part of larger systems especially those that have constraints related to real time computing. This system is said to be embedded and forms part of a whole device and can be identified through the device’s mechanical and hardware parts. It should be noted that these embedded systems come with either digital signal processors or microcontrollers that serve as their processing cores. One of the key characteristics of embedded systems is their ability to effectively dedicate themselves in handling specific tasks. Because of their ability to dedicate themselves in performing specific tasks, you can expect design engineers to have an easier time optimizing the systems as a means of significantly reducing their sizes as well as the product costs and increasing performance and reliability. It should also be noted that that there are a few mass-produced embedded systems that can greatly benefit from scale economies. Embedded systems do not also act as microprocessors that are now used in various traditional computing applications including workstations, laptops and desktops. As a matter of fact, these refer to microprocessors that are mainly used as major components in other pieces of technology such as digital cameras, cell phones, household appliances, portable digital assistants and automobile antilock brake systems. Embedded systems also come in various types including the general, communications, signal processing and control types. The systems also come with limits that you cannot usually find in the desktop industry memory, power consumption, development environment and operator interface. If you want to further increase the level of your understanding about embedded systems, then you should know that Brainmeasures which is considered by many as the most effective online certification company operating worldwide is now offering an embedded systems certification program which can satisfy your desire to learn. The embedded systems course offered by this company is highly comprehensive so your dream of becoming a certified embedded systems professional can be easily achieved. With the kind of comprehensive embedded systems training provided by Brainmeasures, you will find it easier to master every aspect related to embedded systems including their different types, their major functions, their major components and elements, their limits and most remarkable characteristics and how these systems differ to traditional computing applications. As soon as you receive your embedded systems certificate, you can start providing your reliable services in this field to anyone who needs them. How to effectively implement embedded systems? 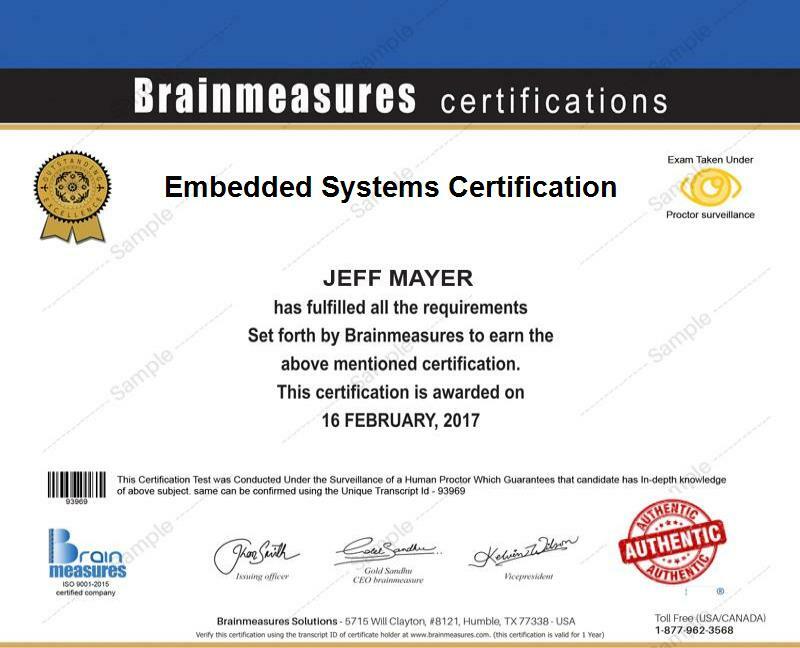 The embedded systems certification program offered by Brainmeasures is one of its most comprehensive courses so you can expect it to continue benefiting a wide range of individuals and professionals. It can greatly benefit anyone who wishes to be part of the embedded systems industry, programmers who wish to gather information about the programming and architecture of embedded systems and hardware designers who plan on generating a more comprehensive overview about all areas linked to embedded systems. Your successful completion of an embedded systems certification course can also serve as your ticket towards earning a higher level of salary. Holding an embedded systems certification can help you in your attempt to work as an embedded systems developer which allows you to enjoy a profitable salary usually within the range of $60,000 to $87,000 yearly. You can use your certification to become an embedded systems engineer and enjoy a salary of $81,000 to $136,000 annually.